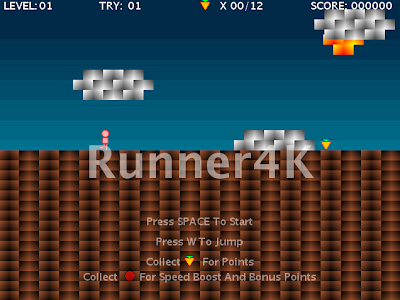 Presenting my first ever Java4K submission - Runner4K. Able to complete it? What's your highest score? Needs sound or needs more levels? It's currently at 3627 3935 3985 bytes so I have a little space to make improvements. btw. you can use Proguard to reduce the size to a minimum. Hmm, does that happen when you are at the edge just before you start falling? Or at any time? I've already used Proguard and Pack200 with gzip to keep the size down. Yes, it only happens at the edge. Are the clouds and ground made of images, or rectangles with gradients? They are made up of rectangles with gradients pre-rendered onto images. Same problem like DrZoidberg and it "lags" on my computer. I still have the problem of dying if I touch the top of the screen, though perhaps the applet wasn't updated on the page yet? Also in general, the man jumps higher and higher as the game goes on. I don't know if that's intentional? It definitely seems to lag as the level proceeds throwing off the physics causing the bigger jumps and missed collisions. Fixing the lag should fix all these issues.  The reason why you can't jump from the edge is because of the simplistic tile collision detection. If I fix it so you can jump even if you are half over the edge it might make it too easy though. Fixed the bug that caused the game to lag as the level proceeds and added 2 more levels. Size now upto 3919 bytes. Changed the colour of the man. Increased the speed to make the game harder. I don't think I have enough space to add power-ups. Once I compress my level data I will know for sure. Added Speed Boost powerup. And posted the source code. Game is now functionally complete. May just try to add some sound effects. I will list all the problems I can identify instead of just leaving a positive or negative review. The controls are bad. It's essentially a one button game, I should be able to press the same key to start as I would to jump. The gradients look really bad for the clouds and sun. It's not obvious what the triangles are for. Clearly they give you points, but there is no sense of reward or objective. The speed is constant, giving the user no sense of control. All jumps are the same height, giving the user even less control. The speed boost doesn't feel like a bonus item. The sudden change coupled with the lack of control makes it seem like something to be avoided, not collected. The timing is too difficult to master. The lack of control means most of the game is trial and error, which is not rewarding. Sometimes there is not enough room for error. Small mistakes mean instant death and pressing W near/over the edge does not result in a jump. The clouds move at the same speed no matter how fast the player goes. The player graphic style does not match the rest of the game. The player's legs don't move fast enough and the animation is obviously off. Look at the topic here on game immersion. You don't need good graphics, but the awkward mix of art and unrealistic animations is too distracting. Consider Mario and Canabalt as an example. In Mario, you don't need to be centered on a block to jump off it. In Canabalt, the hit box is expanded for jumping and landing. You can actually miss a platform by a few pixels before a jump or landing and the game will correct it for you. Adding a variable jump height or double jump feature would change a lot, but you probably should still pay attention to everything else I mentioned. Or add left/right arrows. Wow, tough crowd. You just listed every single thing in the game (art, animation, controls, and gameplay) as a "problem"! I think BestUserName is just trying to provide critical opinions. These are the best kind of responses as it allows you to better your game! Congratulations on completing your first 4K game. I think that all of us should be proud because we are helping contribute to Java4k's running success. Thanks.